I’m a sole parent that is relatively new to towing a travel trailer. ‘Nuff said! However, this round I received help only a private campsite with heart could deliver. The story is below, however first I’ll take you through a little photo tour. For the last week, my son, dog and I escaped to one of our favourite campgrounds for a little R&R. 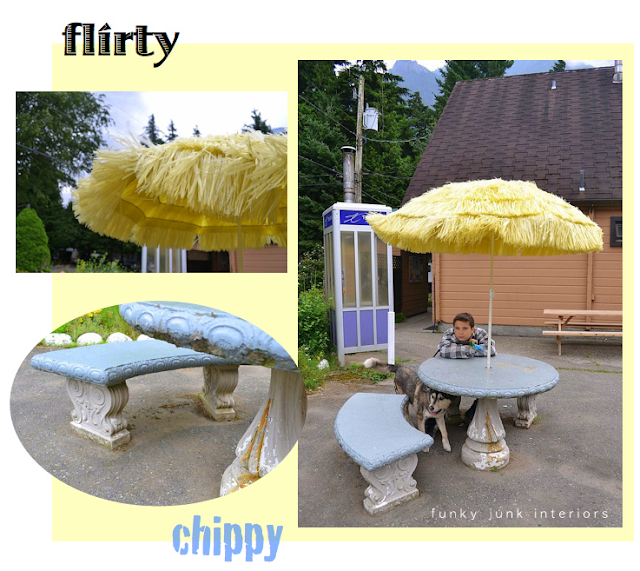 We desired some privacy as well as being close to amenities, so our choice led us to Hope Valley Campground and RV Park, located in Hope, BC Canada. This lovely campsite is family managed by Garry, his wife Marilyn and grandson Andrew. If they aren’t in the office, they’re cleaning cabins or delivering firewood via golf carts or 101 other things campsite managers do. Here’s Garry making picnic tables last year. The link to our 2010 stay is HERE. What’s special about Hope Valley is the fact that the campsite is massively huge with it’s own forest that appears to be plunked right in the middle of wide open country fields. Would you like your site forest or country themed? Take your pick! Where I’m standing was the view we had at our site. And it was extraordinary! Miles of mountain, trees, and when the moonlight illuminated the works at night it took your breath away. Another massive highlight to this place is the pool. It is warm, clean, beautiful and the best babysitter you could ever ask for. 🙂 This is the only place I can end up reading an entire book while my boy happily stays busy all day long. One of our favorite things to do is indulge in an ice cream every so often and sit at this table. Isn’t the umbrella skirt the flirtyest thing ever? We had plans on bringing the laptop here with us however there were glitches with the wi fi at the time, so we decided to put the electronics away this round and camp the old fashioned way. You know, with cooking over real campfires alongside chatty conversation. Not all campsites allow real flames so it was an unbelievable treat to have a fire warm you up all day long if you so desired. We also had clouds so that fire stayed busy. Warm fire, blanket around legs, good summer read, fresh coffee… does it get any better?!? And like any real forest, tall trees are part of that charm. Everywhere you turned, there was a magnificent display of big beautiful bark. They totally dwarfed our red chairs. All kinds of quirks and specialties had you analyzing every nook and cranny. The campsite also has tenting areas, cabins, playgrounds, video game room, pool table, resident TV, and a store with groceries and treats. Honestly? When you stay here, you don’t NEED to leave for anything. And here’s why I fell in love with this campsite all over again. The story says it all. I got brave and chose a country site which is farther away from other campers as well as the front office. What made me decide to ‘live on the edge’ and choose no hookups and a more remote site was the fact that the managers were always making their security rounds with their golf carts. I wanted the view but I also wanted the security of knowing if we needed help, someone would be near. Everything worked without a hitch! My son and I make quite the amazing team with trailer hookups and parking and such so I couldn’t have been more pleased! But… something did happen that I would never have planned for. We turned in for the night when it sounded as if Jenna our dog was going to get sick, so I quickly let her out. She darted from bush to bush in a real hurry with nothing transpiring. Then she took off. TOTALLY not her. I got worried when she didn’t come back so I got my flashlight and started hunting for her. No luck. She disappeared. And I started to worry. I then heard Garry’s golf cart coming down the pathway so I ran out and flagged him down. He insisted he’d find her and tore off. Even if he didn’t, his determination comforted me like you wouldn’t believe. I finally found her deeper in the woods. She was racing through bushes and wouldn’t come out. I tied her up and encouraged her back to our site. Then I allowed her to lead me to where she desired to go. She found a large clump of bush and collapsed. And that’s when I noticed her stomach. It was massively bulged and she started gasping for air. Garry came back and raced over to help. He checked her out and honestly felt she was dying. Her paws went limp and I gulped. The deterioration was just that fast. We were saying our goodbyes to her when I had to take a chance and try calling a 24 hour vet. Garry called Marilyn and she found one. I called and the vet figured it was a twisted stomach thing that would require immediate surgery to the tune of $2-4k to save her. Garry left and returned with Marilyn this time and they loaded Jenna into the truck for me (I couldn’t lift her!) and off my son and I went for a midnight run 1.5 hours away. Half way there, Jenna lifted her head. I was ecstatic! By the time we reached the vet, her stomach had much improved however she still couldn’t walk. The vet took xrays, drew blood work and got her on an IV. The X-rays showed no twisting of the stomach so it could have righted itself or not have happened at all. Which saved me $2-4 k. Thank goodness!!!! Jenna stayed in for 2 days to receive meds and IV fluids. We went home for night but returned to the campsite and stayed one dog-less night in order to bring the trailer home. And it was upon that return that the full impact on how fortunate we really were hit me. Garry and Marilyn totally went beyond the call of campsite duty that night. Could you imagine if we went to a govt run campsite with no one or phone service around? I can’t even go there. Jenna is now home and resting. I was told her blood work showed a pancreatic infection and she’s now on meds and special food and I will be getting advice from my own vet as well. But the vet said the twisted stomach thing could have occurred and sometimes they ‘right themselves’. All I know is, my dog is alive, I ‘only had to fork out $1000 (still ouch but better than 2-4!) and we were yet again watched over by some caring campsite owners. So… would I recommend this campsite? YES. And I have a feeling my little miracle dog would most definitely approve! 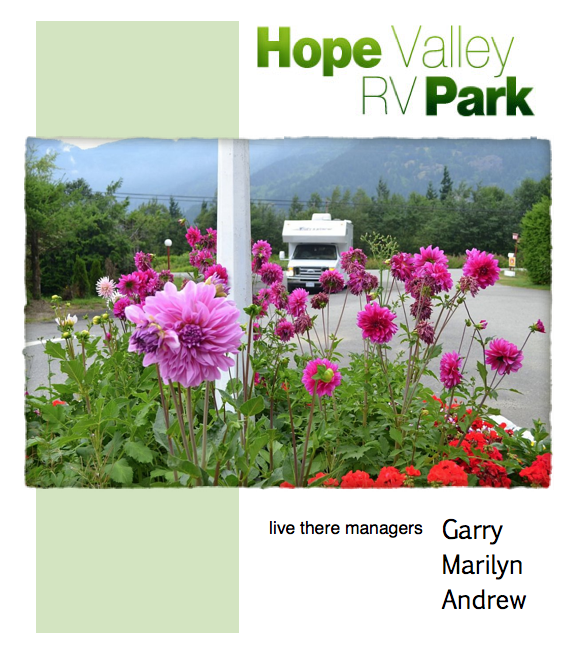 Hope Valley Campground and RV Park is located at 62280 Flood Hope Road, just off the #1 highway, on the outskirts of Hope, British Columbia in Canada. 604 869-9857 You can also find them on Facebook HERE. Yes been out in the wilderness is one thing but getting ill when out there is another. Your Jenna is very lucky, these site owners are remarkable poeple. Donna, what an amazingly beautiful place to vacation. I am so happy that Jenna is okay (dogs have a knack for getting sick when the regular vet is closed) Glad you were able to get in some relaxation. Wow! What a blessing because it does sound like she had flipping her stomach. My sister’s Dane did that… they barely were able to save her. Surgery, the whole nine yards. SO glad Jenna and y’all didn’t have to endure that. The vet told her to make sure Mags didn’t act the fool for about an hour after she’d had a big meal since a loaded stomach acts like a pendulum. Holy crap, I would be a basket case! I had a dog with the same thing, pancreatitis, not a good thing. MY STOMACH was twisting just reading this story! I am so glad she’s OK. Thank God for Garry and Marilyn. What a beautiful campsite and I’m so glad you had a happy ending, or at least a better one, for dear Jenna. Sounds like your son and you had a wonderful time camping. A change of scenery is always nice. Garry and Marilyn are very kind and caring people to help in a time of need. Have a wonderful Monday. …Great story wonderful ending! Our daughter & her husband and new lab puppy are looking for a “local” camp site and I thank you for pointing this one out! Thank goodness for those caring and supportive campground owners. We camp, too, and know how much it means to camp in a place where there is a sense of community. So happy to hear that Jenna is OK now…a heartwarming story. 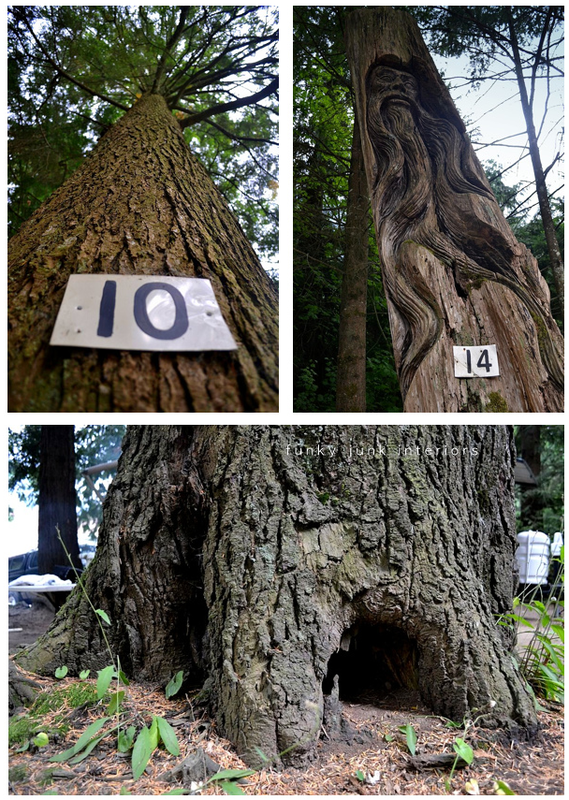 What a beautiful campground and beautiful story! I love a happy ending. I love stories with happy endings. So happy to hear that your sweet dog is better. I also love the fact that you and son had such an amazing experience camping. Beautiful campground too. Your pictures are amazing. When I was camping last summer my dog ran after a deer and tore her ACL. I had to get the surgery which was $2500 and totally worth every penny. OMG how horrifying was that experience? I can’t even imagine being a single mom trying to deal with the dog AND having my son with me during the whole ordeal. Wow. So glad your dog was alright in the end, what a wonderful campsite and owners!! So good to hear that Jenna is alright! What a scare that must have been. What great people to help you out. Looks like it was a beautiful spot! Wow, seeing those trees makes me homesick for BC. So glad Jenna is on the mend. Thank goodness for your *friends* at the campsite. That place looks so beautiful…lucky you. I’m sure glad you like to feel’safe’ and chose these wonderful friends. What a blessing they are. I am off to camp with my daughter and grandson today. Just a local trip…but you have made me think about travel on my own and I will be definatly picking safe sites. Thanks. Oh how scary…glad everything turned out okay. Beautiful camping area. 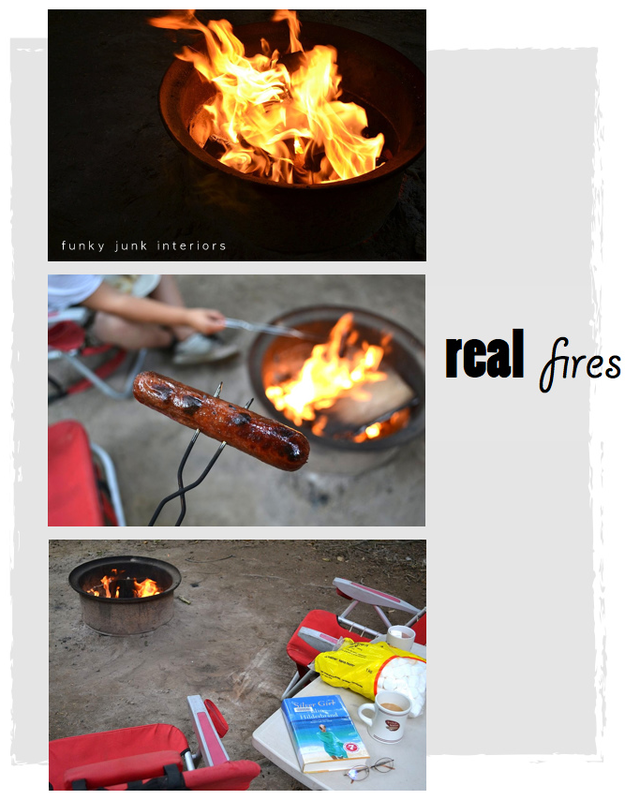 I love camping….as long as there are these types of conveniences. I like showers and toilets and having help is a must. Being a GIANT lover of dogs, these stories always get me and I’m so thankful your girl is doing better. I have basset hounds and they, along with my daughter, are my pride and joy. Love camping in BC! Just got back from Wasa Lake but have been to the Okanogan, Osoyoos, and Kikomun Provincial Park. Love the wilderness! Wow Donna, how scary and fortunate all at the same time! I wish I lived closer, I would go camping there just as a way to say thanks to them for all they did for you! Growing up we backpacked and were often all alone, miles from anyone and anything, so I’m so glad you were someplace where people cared and where you could reach help in time! I hope your sweet pup continues to approve! How absolutely kind and generous of Garry and Marilyn! I’m so glad that Jenna is on the mend. I’ve been through Hope before but will definitely put the campground in our plans for a stay. It looks like a beautifully maintained spot. Thank you for this story! So glad your story had such a happy ending! PS: We camped (in our trailer) in Hope Valley, BC forty some years ago (I guess I’m giving away my age) with our two small children and still remember what a beautiful place it was – even back then! It sounds like a lovely place to stay for some R and R! I know of a few dogs and cats that have died from a twisted bowel, sometimes caused from too much dry food, and not enough water in their diet….and last night I watched a documentary on a wild animal santuary for orphaned, and it was about a baby elephant and sheep befriending each other, and lived as good friends for about 6 months, but then the elephant suddenly got sick…twisted gut, and unfortunately died.The sheep was so distressed, it was sad to see.It can happen out of the blue, and yes very expensive, and not always successful. Your dog is one lucky dog, someone is watching over him, so glad. First I am so glad your dog is ok and that you stayed in a place with such kind people. Your photos are beautiful as always too. I wanted to tell you that my 10 yr old schnauzer had pancreatitis 2x last winter and we almost lost her. Her dog food was recalled and it is a special kind for early kidney problems. She was put on a new medicated food by our vet. Months later her she had pancreatitis. Our vet thought it was a fluke and one time deal. IVs, rest, special food and she was better. Then about 2 weeks later she got it again. Of course our vet was closed so we took her to a vet where a friend works at the front desk. The vet was a smart cookie and checked the dog food which was very high in fat content,therefore the cause of the pancreatitis. She has a new medicated food and all has been well since Janaury. I hope you find out the cause of your dog’s illness. I’m so glad you and your son have a safe environment to camp in and know there’s help if need be. They are wonderful people that run that campsite! 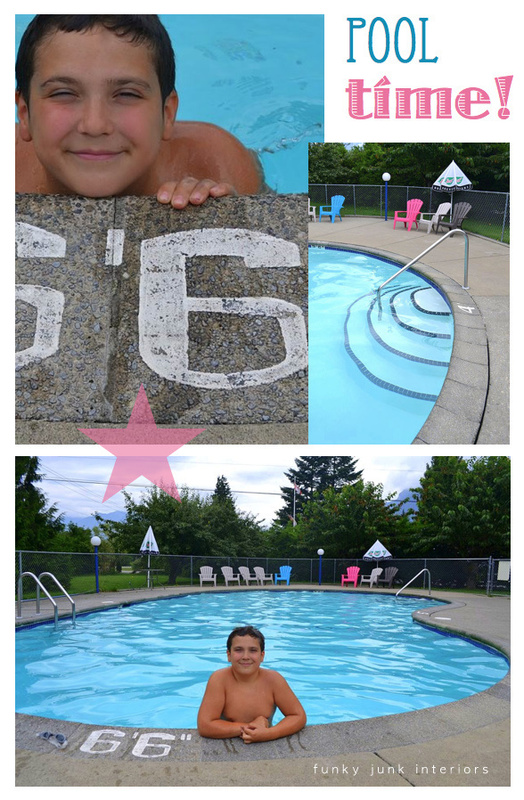 This is just another adventure for you and your son to add to your wonderful memories! And also one w/ a happy ending. When I saw your picture I thought to myself: Who is that young girl? You look fantastic! So happy to hear your Jenna is doing well. We lost our beloved “Bubbles” to that same thing, I forget what the “medical” term for that twisting is. And what wonderful people to be there for you in your time of need. Truly a wonderful place to stay. Very beautiful scenery all around. Glad you and your son have found such a great place to camp. Thanks for sharing this with us. Glad to hear that things turned out well!!! Scarry!! We live about an hour from Hope and love it up there! Thanks for recommending this campground. We’ll have to explore!! You are a good Mom to take on camping with your son. He is a cutie by the way. So sad about Jenna. So glad she is okay. We had a scare at a ski resort. The doctors were about 5 minutes from leaving the mountains. We called them as my husband was having an asthma attack. They took him down the mountain to a hospital and stayed with him til he was ready to come back up the mountain. Now this was in a bad snow storm. They advised me to just stay put and they would take care of him. And they did…….what would we do without helpful people. Thank goodness Jenna is okay. Between that $$$ and the transmission you are officially due for a catastrophe-free fall! Loved all the pics! 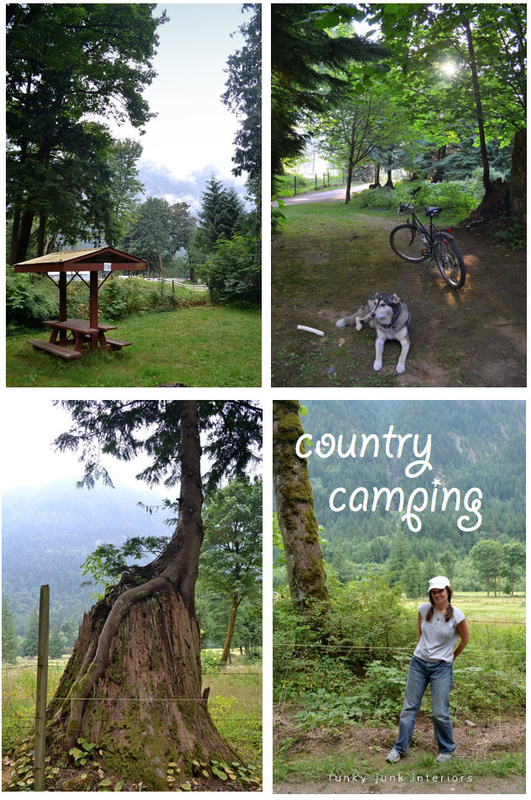 Ohhh Donna ~ That sounds like the best campground ever and oh my gosh it is gorgeous!!! OBTW ~ the picture of you is darling! LOVED reading this. I work at a veterinary hospital and always enjoy animal stories with good endings. That campground looks like pure heaven, too. So glad your puppy is OK. Our 13 yo yellow Lab has pancreatitis. She’s doing great on Hill’s Science Prescription Diet. Oh my goodness! How scary!! I am so happy everything turned out alright! 60th birthday and that was almost 2 years ago. My hubby took me to a parking lot and put out orange cones and said “o.k. park it in between them”, I did so he said o.k. you are on your own. I pull it to Canton, Texas to the big flea market about twice a year. My daughters go with me and so far we have been able to park it and set it up just fine. We are getting faster at setting it up. Your pictures are beautiful, I have never been to Canada and those trees are awesome. It is good to stay in a camp ground that has people that will help you if you need it. Do you realize that every time you have tried to take Cody somewhere you have had a catastrophe. I sure hope you are over all of that. Good luck! I’m glad everything turned out well. I laughed out loud when I saw the pic of your dog standing leash less in front of a sign that says “dogs on leash only”. What a relief that your pup is better. I can imagine the fear and pain, especially in light of losing dear Beethoven. Me and my two dogs are sending good thoughts. I love visiting your blog and viewing all the wonderful decor you create!! Top Notch! I am so very happy that “Jenna” is home save and sound. Here’s wishing for a speedy recovery! I think it is a great campground. And I am glad that your dog ended up being okay. I love camping and there is nothing wrong with being in the midst of it all. It can be just as nice and that was one fabulous campground. What a beautiful place. And such lovely people who run it… I’m so happy you found such a wonderful spot to holiday! Oh…my gosh that is sooo scary. I am so glad that Jenna has greatly improved. My first thought was she’d eaten something she shouldn’t have out in the wilderness. I’m so glad this ended in a happy way. That does sound like a very special place to stay. Sounds like the campsite managers were just as concerned as you about the health of your dog. I love camping…in cabins…too…we also have a tent, bedrolls and air mattresses..to use..when we feel the urge to ruff it…lol..
Hey Donna, Glad you had a good trip all in all. And so fortunate for y’all that you had help with Jenna. 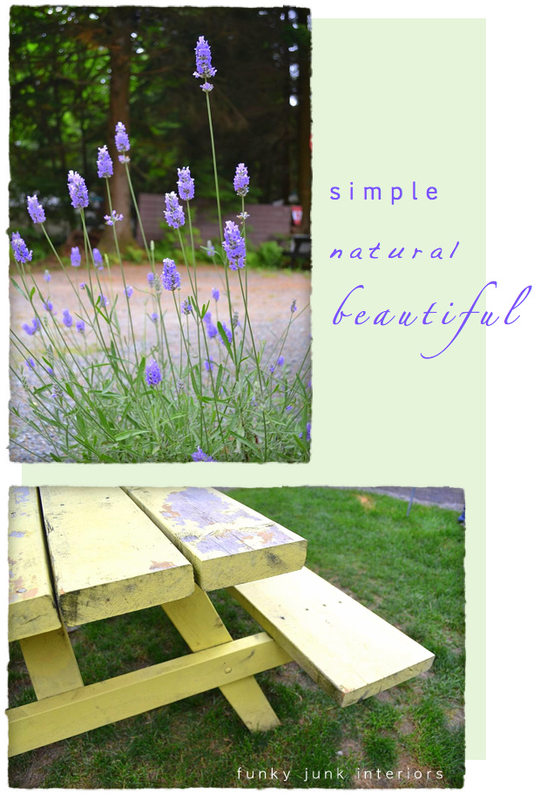 Have you considered setting up the camper in your own yard for campouts at home? Might be fun for a night or two! I’m so glad your dog is recovered from her illness! Just want to say thanks for posting about your animals here. When my cat was recently ill, I remembered something you said about cats and symptoms of trouble with their thyroid gland so I knew before I took her in what the problem was. She is on medication and looks better than she has for a while. Thanks again! about 25 years ago I camped outside of Hope…wonder if it was there??? anyway – so glad that help was there when you needed it! and so glad everything turned out for the best! How awesome that you were surrounded by people so willing to go out of their way to aide you and your dog! These days, those kinds of folks are more difficult to find. I’m so happy to hear that your dog is doing better now. BTW, I’m a relatively new subscriber and I really look forward to seeing what you have each time I open the e-mail message! Thanks!